Fresh Kid Ice, one of the founding members of the Miami hip-hop group 2 Live Crew, has died at 53. Born Christopher Wong Won in 1964 in Port of Spain, Trinidad, he co-founded 2 Live Crew with DJ Mr. Mixx and Amazing V in 1984 and eventually was joined by Luther Campbell. 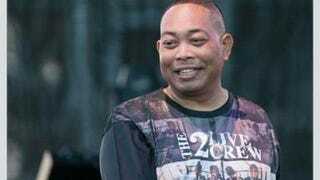 “My Condolence goes out to the family Chris Wong Wong Fresh Kid Ice of the 2 Live Crew who just passed away people we lost a legend,” Campbell wrote on Twitter about Fresh Kid Ice’s Thursday-morning death. Fresh Kid Ice was one of the first to represent Asians in hip-hop and spoke about Asian representation in hip-hop last year in an interview on Vice. Fresh Kid Ice’s manager, DJ Debo, confirmed his death in a Miami hospital from an undisclosed medical condition.